I'll repeat: that's his mom. Good grief. Why don't they cast HER in more movies? On the left there is a picture from the now-legendary HoHoTO party. It's been on TV, it's been in the papers and all around the blogosphere and back again. A group of near-strangers came together and poured their energy into creating a charitable party. Nobody was in charge. Nobody gave orders. Nobody did anything they didn't want to do. And in a matter of days we raised $25,000. What you're seeing there on the left is the DJ setup on stage (yes, the DJ is dressed as a Santa elf -- and yes, nobody did anything they didn't want to do -- you can figure out what that means), hundreds of people boogieing their faces off, and up on the wall an enormous screen displays live incoming Twitter messages tagged "#hohoto". Folks are making DJ requests via Twitter, and if you go to Flickr right now and search on "hohoto" you will see hundreds of photos people have posted of the beautiful craziness that ensued. This is pretty awesome. I blogged before about how the future is looking pretty silly, and I think this is another part of the ongoing sillization of human society. And this is a GOOD thing. Because while there's boogieing and Twittering and elf-dress-up-as-ing, there's also people having hard times, and current economic conditions aren't making that any better. But when people can come together in joy and silliness, and contribute to helping lessen those hard times, I say the world is getting better. I mean, we don't have flying cars yet, it's true -- but maybe there's more important work we ought to be doing besides flying around in cars. Because as cool as that would be, I'd rather there were less hungry people in the world than more flying cars. 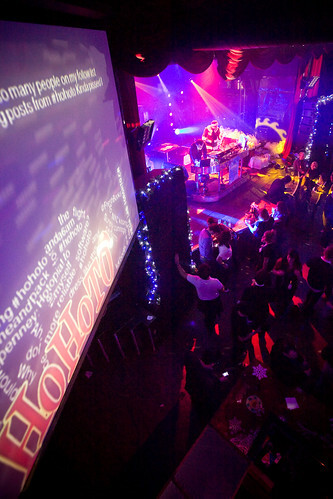 HoHoTO was a tremendous success. It proves (if further proof were needed) that self-organizing groups can accomplish great things. I'm not sure it's a model for social change, but hopefully it will help to serve as an inspiration. The Toronto Twittersphere is all abuzz with ideas and movements and the notion of change and growth, and I truly believe that we're just opening the door to what's possible as the internets begin to realise the next stage of their potential. Somebody in there (might have been remarkk) mentioned the idea of "cells" like Resistance groups organized themselves in: each one self-sufficient and no more than distantly connected to the others, but sharing enough ideals and practices that they can work together to effect enormous change. We don't need grand schemes anymore. We need tiny ones, but ones that infect others and replicate themselves. And silliness, as YouTube shows us, is pretty damn infectious. And as HoHoTO has shown us, it can deliver actual value to society. Not sure I need to dress as an elf, however. This is Anne Filipowski, one of my favourite people ever. When I first came to Toronto, I was shuttling back and forth between two offices: the offices of BetCorp's software and marketing division, on Richmond Street at Spadina, and the offices of Bodog Music, on Yonge Street -- at FINCH (or thereabouts -- for you non-Torontonians, that's like TEN MILES from downtown). It was February, 2007, and after ten years in Vancouver, Toronto was ghastly. Cold, howling winds, and mile after mile of flat, unbroken cityscape. No mountains. No beaches. No bald eagles. Very very few harbour seals. The Bodog Music office was a bit of a ramshackle affair, with customer service reps in dingy grey cubicles, office supplies scattered about and my team -- a couple of php developers, a few designers and a project manager -- stuffed into dark offices seemingly as far away from the rest of the company as possible. There was a really kitchen area, though. And a great balcony, which in Toronto in February is not quite as enticing as you might think. I knew not a soul in Toronto. I could barely find my way to the office. And Torontonian are, well, Lord love them, but they just aren't quite as... friendly... as Westerners. They try. I actually had to practice saying her name so that I could deliver it in the same deadpan monotone she did mine. I'm not kidding. I'd be on the subway, repeating "Filipowski, Filipowski, Filipowski," the whole way up. Maybe the apparent unfriendliness of Torontonians isn't so hard to explain. But of course, that was only the opening salvo. Then came the exchange of sarcastic quips, sneers, and non sequiturs. The goal was always to make her laugh before I cracked up, but I came off the worse most of the time. Filipowski had a serious deadpan, and had that knack for sprinkling her outrageous sarcasm with enough outrageous sincerity that you were always wondering if she really meant that or if... and then you'd see that grin and you knew she'd gotten you again. It was exciting because it was a challenge. Filipowski had that effect on people -- she raised everyone's game. You had to pay attention around Anne, because she was so smart and always paying attention and if you didn't keep up, you were going to get shown up. But always with humour and always with respect for others. Even if Toronto had stayed as unpleasant as it was that February (and it hasn't, by the way; love this town), it still would have been worth coming here to meet Anne. Last time I saw her we went to an Argentinian restaurant for lunch (Argentinian food means steak, apparently) and she told me wacky stories about driving around Greece and we laughed about the lunacy of this business we both worked in. I had hoped at some point that FreshBooks would find itself needing a woman of Filipowski's immense talents, but it never happened. She also promised to take me out to lunch next time. Damn it. So I've been involved in the planning of what looks to be the coolest holiday party in Toronto: HoHoTO! This is going to be a kooky event with Twitter DJ request, live video and photo feeds projected on big screens, drinks and dancing and all kinds of fun, all going to the Daily Bread Food Bank. Sounds like something that took months to organize, right? Try days. And without any official organization, no club secretary, no corporate sponsor (to start; we've got a bunch of them now). Basically a group of folks started talking about the idea on Twitter, and some of us met up on... Tuesday. Four days ago. And now there's a website, a venue, a logo, sponsors and tickets selling like mad. Thousands of dollars raised and hundreds of people coming to something that didn't even exist at the start of this week. It's phenomenal. People can sure be awesome. Like YOU! You can be awesome -- especially if you come to HoHoTO!